There are many books for those who suffer. “I Will Walk With You,” the first book from Greg Fish, is for those who come along beside someone who suffers. Greg draws from the story of his first wife, Barbara, who died from the ravages of a longtime debilitating illness, to offer help and encouragement to anyone who comes along beside a hurting person. If you are a follower of Jesus, you will eventually find yourself at the side of someone who is hurting. Discover God’s transformational power to form us into just the people we need to be to love and care for the ones we walk with in this life. Each chapter concludes with helpful questions for personal or group study. You’ll also receive a short prayer of blessing as you do the hard things that make a difference. 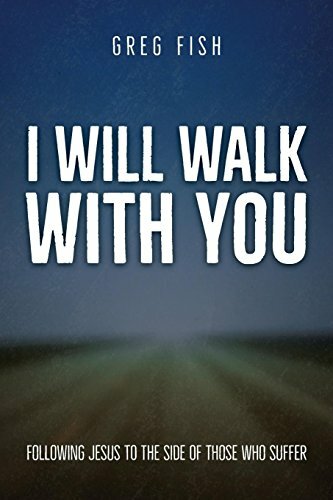 “I Will Walk With You” is available now, in hardcover, softcover, and all ebook formats, on Westbow Press, a division of Thomas Nelson/Zondervan. Signed copies available here in the Greg Fish Ministries store. Also available on Amazon and other online book sellers. Check out a free excerpt from "I Will Walk With You" by clicking here.